“A brilliant critique. His assessment of the ten volumes is certainly most enlightening and puts the entire work in proper perspective.” Satish Bhatnagar, translator of the Hindi script into English. 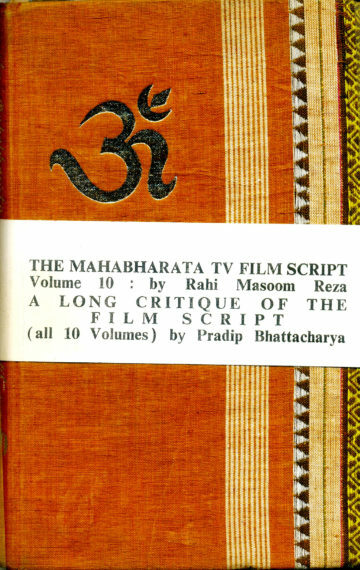 “I feel particularly obliged for your very enlightening critique (and) in-depth study of Mahabharata…all praise for the highly intellectual display of critical excellence…Your critique on the serial was really a masterpiece of writing… heartfelt thanks for the contribution you have made to books on Mahabharata.” Dr. B. R. Chopra, noted film-maker & producer of the tele-epic. Mythology—A Contemporary Appropriation: “Bhattacharya goes to great pains to chronicle these departures (from the epic) bringing to bear his considerable scholarship in this area… Both Reza and Bhattacharya are believers in the feminine cause…With Reza and Bhattacharya the Kunti-Draupadi-Gandhari triumvirate emerges from the no less resplendent than the Arjuna-Karna-Bhima trio, an yang-yin balance which enhances the impact of the epic… Bhattacharya here goes the entire distance in secularising the epic…If Bhattacharya after Bankim Chandra is more concerned with Krishna as Purushottama, Reza is occupied with showing Krishna as Magi not Magic. The end result in both cases is a character more suited for secular absorption.” Champak Chatterjee IAS, The Indian Book Chronicle & in Vyasa’s Mahabharata: Creative Insights, Vol. 2, ed. Padma Sri Prof. P. Lal. Is anybody listening? “Pradip Bhattacharya’s review, in many ways, is much more than a review. It is an independent work that throws a lot of intimate insights into the mysteries of the epic. He has given his own interpretation, besides, pointing out the strengths and weaknesses of Reza’s presentation and those of the English translation. Consequently, what we have in the 10th volume is a work of art, that not only has incisive criticism, but also creative insights that give us much more than what we have in the script. Reza has thrown up many ideas on values and Bhattacharya has dexterously fielded them, enriching his observations with his characteristic expertise. Those important aspects of the Mahabharata which Reza should have included but did not and those aspects that Reza has included but has blundered are pinpointed with ruthless precision and exposed in razor-sharp clarity… The nicest thing about it is that there is no exhibitionism, no pomposity of the pseudo-intellectual, but the simplicity of a mind rich in incisive wisdom that is born out of a comprehensive assimilation of available literature… Bhattacharya has an excellent discussion on the similarity of the principal female characters and the concept of eternal virginity…we get information not commonly known…His discussion of lust being the nemesis of the Paurava Dynasty is one important contribution…he startlingly reveals that it was Dharma who protected Draupadi, not Krishna. He gives us a hint that the entire episode of vastraharana is an interpolation. Bhattacharya effectively brings out Krishna’s political acumen… Bhattacharya’s discussion of the Sishupala incident is significant in dispelling the myth of Bhishma’s unquestioned supremacy (and) for the demystification of Krishna’s superhuman Halo… Bhattacharya introduces the Kalpataru concept but unfortunately does not elaborate… But his discussion on the Karna-Kunti relationship provides perhaps the most interesting analysis of a much-talked about incident of the Mahabharata…Bhattacharya has very sensitively brought out an expose on Dharma as spoken by various characters…he has been able to, very effectively, garnish his review with quotations and discussions from authors…He has also quoted parallel situations from European mythology and literature…We also find evidence of his expertise in this field (of Transactional Analysis) in his work…Bhattacharya has also brought in modern day parallels…these, too, have added a freshness to the work and brought in a touch of contemporaneity…a superb work of penmanship.” Maj. Gen. S.K. Sen VSM, Vyasa’s Mahabharata: Creative Insights Vol. 2 (ed. Padma Sri Prof. P. Lal). “I like rehandling of old texts with changes in accents and nuances. Some of these may not be quite sound and for creative changes tributes are due. Reza deserves such a homage and your long critique pays it unreservedly. It must have taken through study and is most comprehensive.” Krishna Chaitanya. Epic which came to the drawing room: “Volume X has also a Critique running to about 280 pages of high class English prose which is at once a fine addition to modern Indo-Anglian English literature and an extremely fair, critical review of Rahi Masoom Reza’s monumental work in Hindi for the T.V. Serial of the Mahabharata.…Bhattacharya’s Critique is a masterpiece of Literature by itself and it can be safely recommended for special study for students of modern mass communication schools in the English speaking world.” K. Vedamurty, The Hindu. A trip down the memory lane: “Pradip Bhattacharya has a brilliant epic simile to ram it (the public stripping of Draupadi) down our intelligence…truly a meaningful gift to the coming generations. In his masterly analysis of the script, (he) whirls us through the inner countries of the mind to get at the core significance of Vyasa’s epic as well as Reza’s version. In the course of a painstaking, fair and boldly critical study of Reza’s script, he brings in scores of other versions of Vyasa’s epic characters… There is a blow-by-blow comparison of Vyasa and Reza…According to Bhattacharya, the very fact that an Indian Muslim has brilliantly recast the epic is a sterling validation of the universality of appeal of Rishi Vyasa’s epic…Backed by wide reading in Indian and Western literatures, Pradip ‘load every rift with ore’ in his critique. The way Reza and he have amply fulfilled Sri Aurobindo’s dream for a ‘weighty, careful and unbiased study of the work, canto by canto, passage by passage, line by line, which can alone bring us to any valuable conclusions.” Dr. Prema Nandakumar, The Hindu.